London studio Industrial Facility has unveiled a collection of lacquered vessels at Milan design week that are based on traditional Japanese soup and rice bowls. The design duo partnered with non-profit initiative Japan Creative – which supports Japanese crafts for contemporary pieces – and manufacturer Sekisaka, which has been making traditional lacquerware for over 300 years. These days, Sekisaka mostly makes plastic versions of lacquered vessels, designed for use by schools, hospitals, airlines and the hospitality industry. 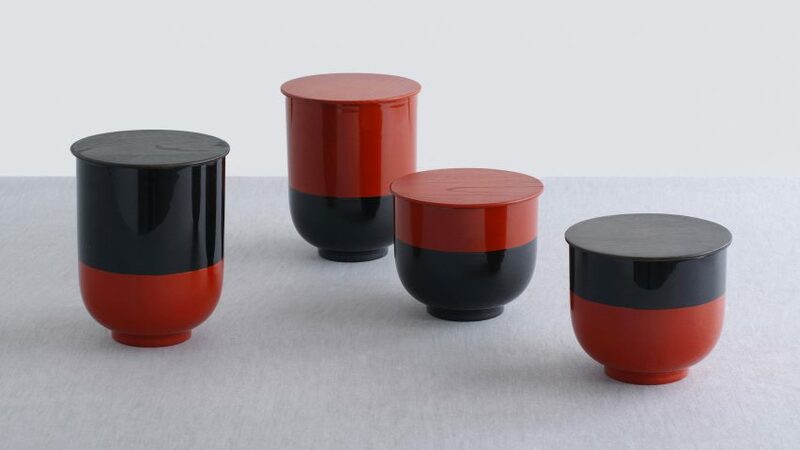 In response to the gradual replacement of real lacquer with replica versions, Industrial Facility has created two sets of vessels – an urushi lacquer edition, and a more affordable polyurethane collection. 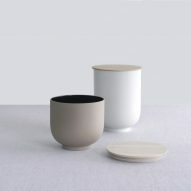 For everyday use, the studio created rounded and oblong containers in muted colours with flat wooden lids. 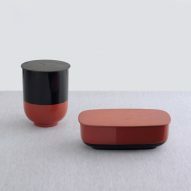 The lacquerware is also lidded, and has contrasting red and black striped sections. Its stretched appearance plays on the form of typical rice and soup bowls. Japan Creative's mission to promote traditional craft methods has also seen the organisation partner with German designer Stefan Diez on a collection of furniture made from raw bamboo trunks tied together with yarn. The rediscovery of traditional crafts has been a recurring theme at Milan design week. South African designer Christopher Jenner has unveiled a ceramics collection made with the rare Zisha clay from Yixing in eastern China – a style of pottery that dates back hundreds of years – while the Confluence: 20+ exhibition includes new takes on traditional textiles, porcelain and calligraphy by Hong Kong designers. Industrial Facility's Store collection is on show at Palazzo Litta in Milan's 5Vie district from 4 to 9 April. Also on display during Milan design week is a showcase of experiments with wood materials by Dutch collective Envisions and a range of wallpapers created by designers including Faye Toogood and Snarkitecture.